After rekindling my enjoyment of watching anime on a regular basis in 2016, 2017 ended up being a huge bust for me — most seasons had little if nothing I wanted to watch, and the shows that did look interesting to me didn’t keep me watching for more than an episode or two. This last season sounded promising, and again, I was disappointed by everything, including Inuyashiki, which may be fine, but after one episode I didn’t really feel the urge to continue (even though I really enjoyed the manga series). But I haven’t given up yet, and although I’ll again say that I’m actually excited by a few series for the winter season, I’ve already watched the first episode for three of them, and it’s off to a good start. Here’s what I want to check out this season (as always, I get my info from AniChart). I watched the first episode of this today, and really loved where it ended. We’re presented with a family that is entangled in a kidnapping, and to address this, the grandfather manages to stop time — and that’s just the start of how interesting things get, when everything doesn’t go according to plan. I’m definitely looking forward to watching the second episode. 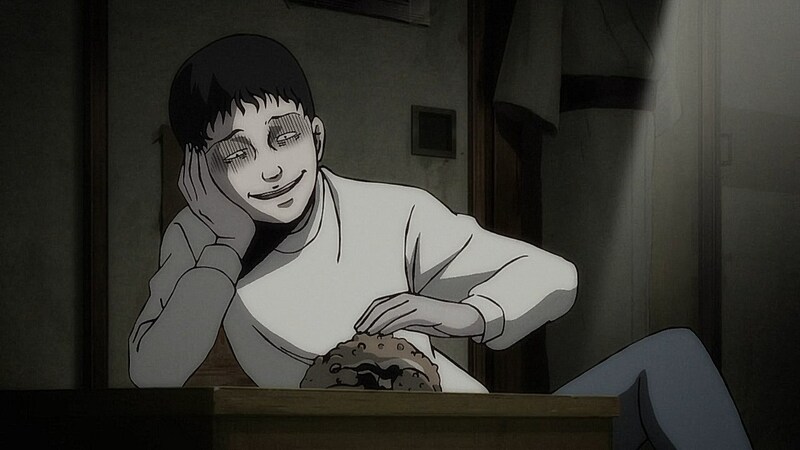 I absolutely adore the horror manga of Junji Ito, and was so excited when they announced this anthology series — each episode is based on a short story by Ito. I watched the first episode, and it was fantastic. This was a safe bet for me, but I’m still glad it delivered. This is a Netflix original that launched this past Friday. I’ve never watched any Devilman series (or read any of the manga), but as soon as I saw that Masaaki Yuasa was directing it, I got excited. I watched the first episode, and it definitely feels like something that is straight out of the mind of Yuasa (especially in style) — I’ll admit that it was quite a bit more sexualized than I was expecting. I’m looking forward to watching the rest. This is another Netflix original, and it’s only set to come out in March. Sounds like a mystery/thriller — chasing a serial killer — in a high-tech setting. Definitely the sort of thing I might like, and it’s by Production I.G, so will check it out.